The latest release of Pointwise’s computational fluid dynamics (CFD) mesh generation software delivers high-order, curved mesh generation, the fundamental building block required by the next generation of CFD solver software that promises dramatic increases in solution accuracy and computational efficiency. 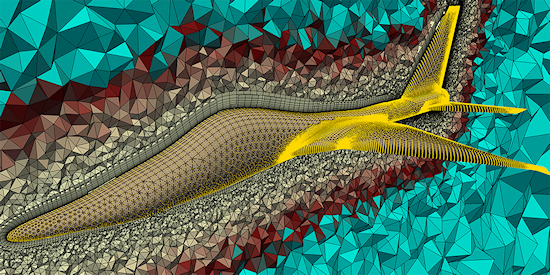 "High-order numerical schemes hold a great deal of promise for improving the accuracy of CFD with the added benefit of a decrease in the number of mesh cells versus linear mesh methods," said John Chawner, Pointwise’s president. Pointwise V18.2 was used to generate this polynomial degree 2 hybrid mesh for a notional fighter aircraft designed in the Engineering Sketch Pad software. The surface mesh consists of a mixture of quadrilateral and triangular cells (black lines) with yellow dots indicating the nodes inserted on mesh edges. A cut through the hybrid volume mesh down the aircraft centerline shows the cells colored by volume. Image made in ParaView. Pointwise has been fortunate to work with leading researchers across the globe while developing this high-order capability and is honored by their enthusiasm for its release in the production software. Pointwise Version 18.2 also accelerates the generation of surface meshes (named spacing constraints, a mesh spacing synchronization command, and a quick way to split curves into pieces of equal arclength), enhances the generation of hybrid meshes with the T-Rex technique, and offers improved user experiences (an on-screen tool for panning and rotating the view, a vastly expanded context menu, and a quick display of keyboard shortcuts).